ere is the situation guys, the more I look for a new phone to buy, the more confused I get as the market is literally flooded with new offers every day. Especially in the budget category where the competition has become really intense. Here is another addition to this particular market segment – this video review is dedicated to Sony Xperia J.
Hardware-wise this model maybe stands the closest to Sony Xperia Miro, which you can find in DigitalMagnet video review database. But I’d rather give J more credit as it provides larger screen, better resolution and pixel density and a longer battery life. You can see for yourself that the design is something we have already seen in other Sony models. It stands out with a stylish appearance but that’s a bit needless to say because it belongs to the Xperia family and they all excel with slim and exquisite design. The screen is this smartphone strong suite, the 4’’ TFT touch screen along with the Adreno 200 graphic processor provide sharp and bright picture with rich hues. The resolution is 480x854pixels. Corning Gorilla Glass technology protects your display from scratches, this is a must within my requirements when choosing a phone, as mine frequently can be found in the same pocket where I keep my keys. The explanation to the good visual performance on this smartphone is called Sony Mobile BRAVIA engine. 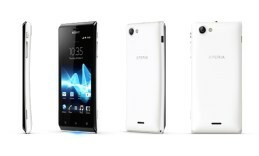 In comparison the Xperia Miro’s 165, the J model has a much better pixel density of 245 points per inch. The sensor technology is quick and very responsive not only to a single touch but to two-finger gestures as well. I love it when I browse through pictures and need to zoom in and out, it is so much easier with just the tips of your fingers. The sleek case of Xperia J is available in 4 different colors: black, white, pink and gold. Under the colorful lid there is a single-core Qualcomm Snapdragon processor working at 1GHz frequency. The operating RAM is 512MB. The weight is maybe the only category where Miro beats the Xperia J which weighs a bit more – 124g. The platform on board is Android 4.0 Ice Cream Sandwich but it is supposed to be easily updated to the newer Jelly Bean version. The Android smartphone features really cool smart illuminations: they notify you whenever you have incoming text messages, voice messages and what’s even cooler even Facebook updates. Now I will not bother to go in every 5 minutes to see what my friends are up to. Stay in touch with style and grace on this sleek Xperia J smartphone. The built-in internal storage available to the users is 2GB but the SD card slot provides up to 32GB more. The base camera is a 5MP one and produces high quality images at 2592×1944 pixel resolution. It features most of what you need to take a decent photo at a point-and-shoot level and also geo-tagging, image stabilization and a strong LED flash. The secondary one is a VGA camera and its basic purpose is video calling but I confess I sometimes use it to fix my make up when I have no mirror around. Pretty handy don’t you think? If you have the regular-sized SIM card, you must know that you need to replace it with the micro type on this model. What deserves thumbs up on this smartphone is also the sound, it is loud and clear at the same time. You can easily connect the Xperia J headset to a computer via the micro USB v2.0. The 1750 mAh Li-Ion battery guarantees around 5 and a half hours of talk and an average of 25 days left in stand-by.